Nelson Orthodontics is co-owned by Drs Andrew Lush and Andrew Marriott. Both have a philosophy of 'evidence based' dentistry. This means they will determine the best course of orthodontic treatment for our patients based on clinical evidence rather than on 'marketing hype'. They have invested in leading edge technology to analysis each patient’s individual situation and recommend the best treatment for each patient. Nelson Orthodontics was one of the first NZAO (New Zealand Association of Orthodontists) accredited practices in the country, which means we have been audited to assure you of the highest standards of clinical, practice management and patient services. Andrew has been a full time orthodontist for 26 years, and started Nelson Orthodontics in 1991. He is a registered specialist with the Dental Council of New Zealand and also has a fellowship of the Royal Australasian College of Dental Surgeons. Andrew is passionate about the continuing advancement of orthodontics and continual professional development in the sector. He has been a past secretary of the Nelson Branch of the NZ Dental Association and secretary of the NZAO. 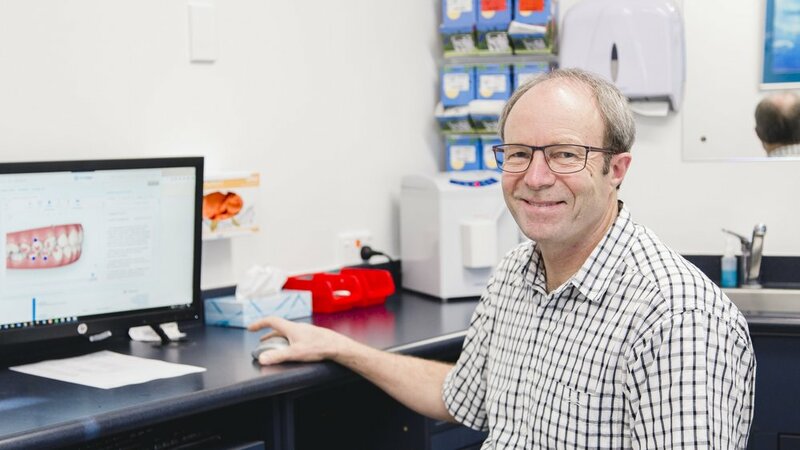 Andrew treats our Blenheim patients and is normally in Blenheim two days a fortnight for routine checkups with our Blenheim patients – this helps to cut down on the amount of Nelson travel our Blenheim patients need to make. He worked as a dental house surgeon at Auckland Hospital and in private dental practices in Auckland and in the UK before doing his MDS degree in Orthodontics at Otago. Andrew is married to Sue and has one daughter. When he isn't practicing orthodontics, he is a keen glider pilot, enthusiastic mountain biker and occasional windsurfer. Andrew Marriott has been a full time orthodontist for 17 years and joined Nelson Orthodontics in 2002. He is a registered specialist orthodontist with the Dental Council of New Zealand and is a Member of the Royal College of Surgeons of England and the Royal Australasian College of Dental Surgeons. He is a passionate founding trustee of the FORENZAO trust which raises funds for orthodontic research in New Zealand, and also promotes the objectives of the Wish for a Smile foundation which provides financial assistance to young New Zealanders who would otherwise be unable to access orthodontic care. Andrew has busy young family with wife, Sarah-Jane. Outside of work he enjoys tramping, mountain biking, and is a keen supporter of local rugby. All our surgery staff are registered orthodontic auxiliaries with the New Zealand Dental Council or are in a training program to become registered. We use a team approach to provide quality care. You may also speak to our Practice Manager or one of our two reception staff who help us to run our busy practice.